While chasing India's mammoth first innings total of 622/7, the hosts Australia were reduced to 236 for 6, still trailing by 386 runs at Stumps of Day 3, with Peter Handscomb (28 not out) and Pat Cummins (25 not out) at the crease. 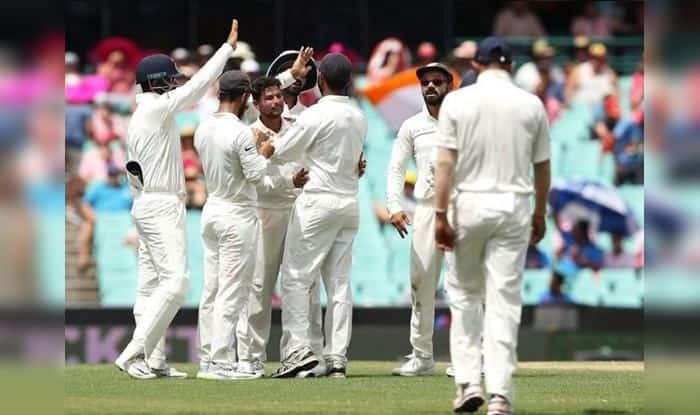 India vs Australia 4th Test Sydney Day 3 Report: On Day 3 of the ongoing fourth and final Test, players of both teams went off with an hour’s play pending, as bad light hampered proceedings before rain intervened and brought out early stumps. While chasing India’s mammoth first innings total of 622/7, the hosts Australia were reduced to 236 for 6, still trailing by 386 runs at Stumps of Day 3, with Peter Handscomb (28 not out) and Pat Cummins (25 not out) at the crease. Both spinners Kuldeep Yadav (3-71) and Ravindra Jadeja (2-62) shared five wickets to put India in a commanding position. Post-tea, Yadav struck on the sixth ball as Tim Paine (5) was completely foxed by the turn he was getting. The spinner pitched the ball up and the batsman, going for a drive, failed to counter it and was bowled. Post lunch, Australia made the worst start possible with Marcus Harris (79) getting out before he could settle in again. In the third over after the restart, he played on off Jadeja. In the 49th over, the left-arm spinner made it a double blow six overs later as Shaun Marsh (8) was caught at slip. Australia barely managed to cross 150 in the 52nd over as India piled on the pressure. Unlike in the first session, only 35 runs came in the first hour of play. The pace of scoring did improve in the second hour with 41 runs taken, but India again struck twice to peg them back. Ajinkya Rahane held a brilliant catch at short midwicket to send back Marnus Labuschagnge (38) off Mohammed Shami (1-54) soon after. Travis Head (20) added 40 runs for the fifth wicket with Handscomb for the fifth wicket and brought some respite to the desperate Australian middle order. But once again, as things looked settled down, they manufactured a wicket with Head hitting a full toss straight back at Yadav and was out caught. Earlier Harris’ half-century had helped Australia reach 122 for one at lunch. Starting from overnight 24 for no loss, Australia quickly got off the blocks in the morning session. There wasn’t much help from the pitch for the two pacers Shami and Jasprit Bumrah (0-43) who started proceedings. It could be seen from Jadeja being brought on to bowl in the fifth over of the morning, while left-arm wrist spinner Yadav came on to bowl three overs later. Australia sped to 50 within seven overs of play on this third morning, adding 27 runs in 29 minutes of play in the morning. Later, they crossed 100 in the 30th over. India’s lone success came from Yadav as Usman Khawaja (27) played a loose stroke against the spin and hit straight to Cheteshwar Pujara at mid-wicket. Jadeja though struggled to find his control and was even hit for three fours in one by Harris, who brought up his second Test half-century off only 67 balls. They brought up their 50-partnership off 103 balls on a warm day. On day one, Cheteshwar Pujara scored his 18th Test hundred, while Rishabh Pant scored his second Test century on day two as India had piled up a massive score.